Shippers can see how their facilities stack up by viewing the Facilities Ratings in Uber's shipper platform. Uber Freight says it’s bringing Facility Ratings to its load-matching app, in much the same way it added user ratings to its rideshare platform. A new function within the Uber Freight app, Facility Ratings gives carriers and drivers the ability to share honest feedback about the facilities they visit. That gives shippers the insights they need to make changes at facilities and improve drivers' experiences at those facilities. The new feature allows carriers and their drivers to rate facilities on a scale of 1 to 5, with the option to leave a written review. These ratings, along with details about a facility’s amenities, are available to all Uber Freight users. For example, when drivers are deciding whether or not to book a load, information around bathrooms, parking, on-site scales, and more will be available at their fingertips. Detention time, bathroom access, and parking availability are all factors that can incentivize or discourage drivers from choosing loads at a given facility. According to a Zipline Logistics survey of 150 trucking companies in 2018, 80% of carrier respondents refused to take loads from facilities for reasons such as inflexible appointment hours and lengthy detention times. 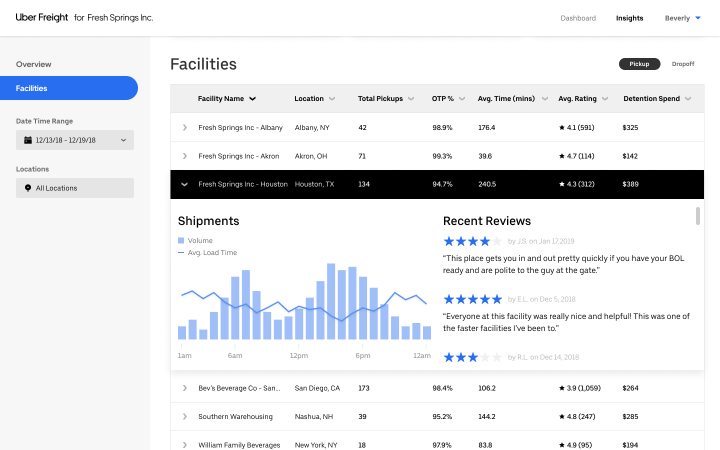 Facility Ratings data can be accessed in the shipper platform, helping shippers to assess their facilities based on feedback from drivers and determine where and how to focus improvement efforts. Facility Ratings is already available to all users in the carrier app and will roll out to shippers via the shipper platform in the coming weeks.